A week ago, I sat in an auditorium and listened to Steve Sinofsky talk about the tablet market. He talked about how the iPad was a great device, and a logical extension of the iPhone. Give iOS a bigger screen and all of the sudden you could do some things better on this new device. He talked about Android tablets, and Google’s learning process there, going from a phone OS on a tablet to eventually building Holo and creating a tablet-specific experience. He had nothing but good things to say about both competitors. I couldn’t tell just how sincere he was being, I don’t know Mr. Sinofsky all that well, but his thoughts were genuine, his analysis spot-on. Both Apple and Google tablets were good, in their own ways. What Steve said next didn’t really resonate with me until I had spent a few days with Surface. He called Surface and Windows RT Microsoft’s “perspective” on tablets. I don’t know if he even specifically called it a tablet, what stuck out was his emphasis on perspective. I then listened to Panos Panay, GM of Microsoft’s Surface division, talk about wanting to control the messaging around Surface. He talked about how Microsoft’s June 18th event was scheduled because Surface was about to hit a point in its production where he could no longer guarantee there wouldn’t be substantial leaks about what the product actually was. He talked about the strict usage and testing guidelines everyone at Microsoft was forced to adhere to, again to avoid major leaks. He didn’t want Surface to be judged immediately and cast aside on someone else’s terms, because of some leak. Panos Panay wanted Microsoft to be the ones to bring Surface to market. Sure some rumors leaked about it before the June 18th event. A couple of weeks earlier, while I was in Taiwan, I even heard the local OEMs complaining about it (a lot of the “surprised” public outrage by Taiwanese OEMs was mostly politics). But for the most part, we didn’t know what Surface looked like and we had no concept of its design goals. Touch and Type Cover were both well guarded secrets. I started off by recounting both of these stories for a reason. After using Microsoft’s Surface for the past week I can say that I honestly get it. This isn’t an iPad competitor, nor is it an Android tablet competitor. It truly is something different. A unique perspective, not necessarily the right one, but a different one that will definitely resonate well with some (not all) users. After the past week I also understand Panos Panay’s desire for secrecy. From a distance, without using one, Surface is easy to judge. It’s a Windows tablet that doesn’t run most Windows applications, that doesn’t have most of the same new mobile apps that iOS and Android have, and it’s not priced aggressively enough to make those facts disappear. After living with Surface however, I understand the appeal. It’s worth a discussion, perhaps even consideration as it does some things better than any tablet on the market, and it does others worse. Like all tablets (or smartphones even), there is no perfect platform, there are simply combinations of features and tradeoffs that resonate better with some users more than others. There are different perspectives. Surface is Microsoft’s perspective. With the exception of some technical display discussion, Microsoft hardly mentioned the iPad in our Surface briefing. And when it did, it did so in a positive light. 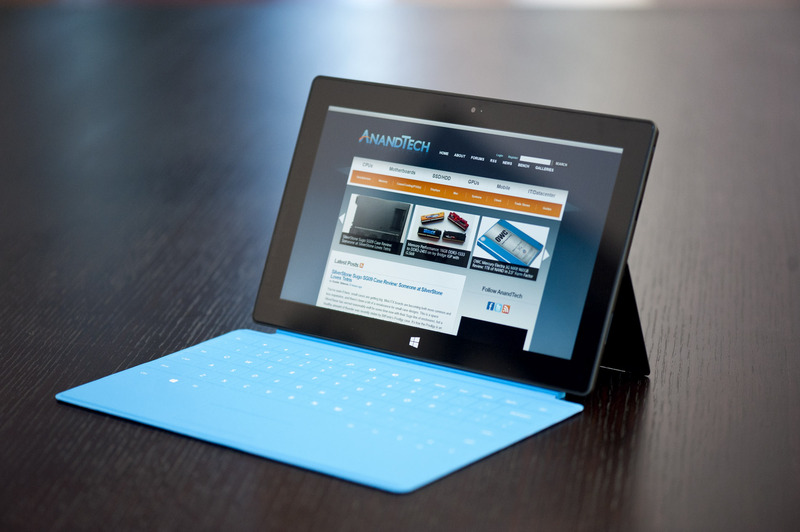 Microsoft isn’t delusional, the iPad is clearly a very well executed tablet. At the same time it believes there’s room for something else. Been using an Thinkpad X41 tablet for ages at work, will probably pick this up to replace it. I mean, this thing does have pen input yes? I didn't see much mention of it in the review. Missing a few benchmarks as well, which is kind of a shame as the Surface is the one of the most interesting computing device put out in the last while. I don't think this is correct. If you look at the "Help me choose" document published by Microsoft, then they state that "Capacitive pens available for purchase". True, these aren't active pens, with pressure sensitivity, but as far as I'm aware, WinRT will have handwriting recognition. All capacitive touch screens work with capacitive pens. In my experience capacitive pens write like crayons. Running an older tablet with a worse input array I have perceived capacitive hand writting recognition on win 8 as being quicker and more accurate compared to win 7. That said, I still find it painfully slow compared to the on-screen keyboard. Capacitive pen compared to an active pen is like comparing a baby tricycle and a jet airplane. Not even in the same league. But unless you have tried something remotely like the latter, you won't even know that. I know it runs on ARM, does that not make it a laptop, is a server using ARM not a server? No matter how u spin it, it either a tablet (of which there are many and 99.9% use ARM) or it's a laptop with less power and less headroom (regarding cooling).